On the market for less than a month, the 28.5 metre motor yacht Walzing Mathilda has been sold with Marc Haendle at Ocean Independence acting for the buyer and seller. Built in steel and aluminium by Dutch yard Hakvoort to a design by Henk Lunstroo, she was delivered in 1995 and was last refitted in 2004. Accommodation in an interior designed by Felix Buytendijk is for 10 guests in five cabins consisting of a full beam master suite, two doubles and two twins, all with entertainment centres and en suite shower facilities. In addition, there are quarters for three crew. Formerly named Lady Libra and always immaculately maintained, her main deck saloon has a lounge area with comfortable settees, coffee tables, a bar and an entertainment centre featuring a 42 inch Sony television screen. Forward is a separate formal dining area with seating for 10 guests while a stairway leads down to the guest accommodation. Outdoor spaces are plentiful and include the main aft deck with built in upholstered seating and a table and there is a large sundeck with sun pads and loungers offering panoramic views as the yacht speeds between Mediterranean hotspots. In 2015 a further minor refit was undertaken at the bridge area. 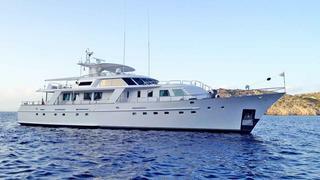 A successful charter yacht, she was offered for sale with her water toys including a Zodiac RIB tender. Twin 410hp Caterpillar diesel engines give her a cruising speed of 12 knots and a range of 3,000 nautical miles at 9.2 knots. Lying near Alicante, Spain, Walzing Mathilda was asking €1,750, 000 with VAT paid.